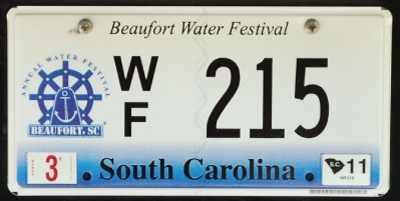 We are happy to announce that the public can now purchase a specialized Beaufort Water Festival license plate. The fee is $30.00 every two years, in addition to the regular motor vehicle registration fee. The plate is available to the general public and there are no special requirements for acquiring the plate. To get your license plate, just go to your local DMV in SC and tell them you would like to purchase the Beaufort Water Festival Specialty License plate. A portion of the fees is returned to the Beaufort Water Festival to help with marketing and promoting the summertime event. Please click on the website below for more information.